Origin and Habitat: Sinocrassula yunnanensis, is native to south western China (Yunnan province), north and south of Burma, north-western India, Sumatra and Bhutan. Altitude range: This species thrives between 2500 and 2800 metres above sea level. Habitat and ecology: It occurs in the cracks of rocks where is has good drainage. Sinocrassula yunnanensis f. cristata hort. Crassula yunnanensis f. cristata hort. Sedum indicum var. yunnanense f. cristatum hort. 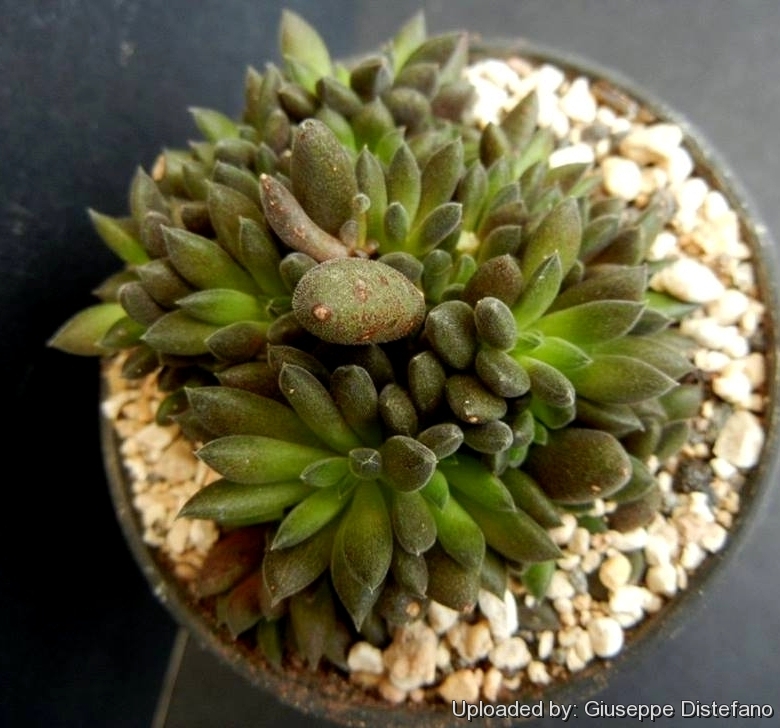 Description: Sinocrassula yunnanensis or "Chinese Jade", is a small perennial, rosette succulent about 5-10 cm tall that can eventually develops into dense clumps, whose half- round leaves are flattened on the upper side, end in a sharp tip, and have finely papillous hair. At flowering time the rosette lengthen in a richly branched inflorescence about 10 cm long; the flowers are small and white. It is the best-known species and blooms generously. Sinocrassula yunnanensis f. cristata, a monstrous form, is often cultivated as a curiosity. Rosettes: Upright, 2.5 to 3.5 cm in diameter of 50-70 closely set fleshy pointed leaves. The plant is monocarpic, the individual rosette blooms only once, then dies, replaced by the close ones. Leaves: Small 12-25(-30) long, 4.5-6 mm thick, fleshy, dark bluish green to brownish red colour, kidney-shaped, oblanceolate or spatulate, rounded on the back surface, flattened, almost terete, acuminate, each with a mucro (soft point) at the tip and patterned with purplish brown speckles and covered with minute, soft, white and glandular hairs. The leaves are only loosely attached, will root and grow new plants. Easily plantlets become weeds in the pots of other species. Inflorescence: The inflorescence, on a densely leafy, minutely hairy, deep red peduncle 3-15 cm long, is a dense, flattish, leafy panicle, more or less dense, about 2.5 cm in diameter with about 50 minute, whitish flowers. Stem-leaves in 3 series lanceolate, tapered, mucronate. Flowers: Mostly large. Sepals linear-lanceolate, about 1.8 mm long, minutely papillate, apex obtuse. Petals yellowish green, red-tipped oblong-lanceolate, 3-4 mm long, 1 mm wide, minutely papillate on the back. Stamens shorter than petals. Nectar scales quadrate. Carpels lanceolate. Styles short. The flowers scent is of a sweet-sour pungency rather attractive to some but, at any rate, not unpleasant. Blooming season: Autumn or early winter. They can be grown outdoors on rock crevices with favourable water regime, eastern slopes alpine house, poor, drained soil, shading in summer. Propagation: This is a tough plant which spreads aggressively, both vegetatively by dropped leaves that root easily and by seed. Sow the seeds in winter (13-18°C) uncovered, they will germ in about 1-3 months, division of old plant can be made in spring and late summer; cuttings in summer. The crested variations can be propagated only by vegetative means, from the crested parts, but seed of such a plant is likely to produce normal progeny.